13 Jan 2015 - Thankful - Dreams are what you wake up from. Since this was my last week at my current job. 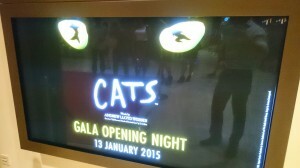 For catching Cats, the Musical for the first time. Of first. My first Cats musical and S's first musical, ever!